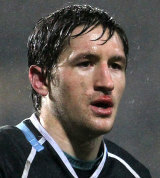 Henry Pyrgos is a Glasgow Warriors scrum-half who was called into the Scotland squad for their autumn internationals in October 2012. Pyrgos joined Glasgow in 2010 after going to Loughborough University. He was rewarded with a new two-year contract in 2012 and with Chris Cusiter out injured, Pyrgos was called into the senior Scotland squad.